The hero of last football word-cup Paul the Octopus has breathed (or does he breathe under water ?) his last. The hero is no more…Rest in Peace ! 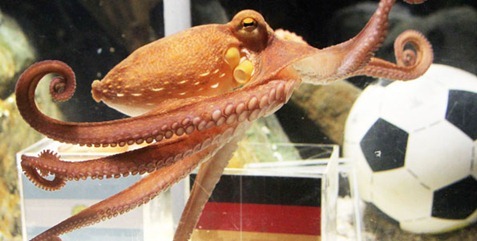 "Management and staff at the Oberhausen Sea Life Centre were devastated to discover that oracle octopus Paul, who achieved global renown during the recent World Cup, had passed away overnight,"
The word cup undoubtedly belonged to Paul the Octopus, who flawlessly predicted the winner of each and every game that he was asked to choose the winner. Nearly every international media online as well as offline went ga-ga over his predictions, which reached the pinnacle during the finals of the Football World Cup. There was a 1 in billion chance that he could get all the answers right and he did ! People will remember him for a long long time – his memory will stay. I am not sure if we will get any other creature like this ever again. Paul the Octopus – Rest in Peace ! Mobile Number Portability from Nov 1st..